Our 5000K LED corn bulb is 12.2" long, 5" in diameter. and has an E39 large mogul base( about 1.5" ). If use it in an enclosed fixture, like wall packs, canopy, parking lot shoebox fixture, street light, etc. Make sure the Min. lamp compartment dimensions are 17" * 10" * 10". 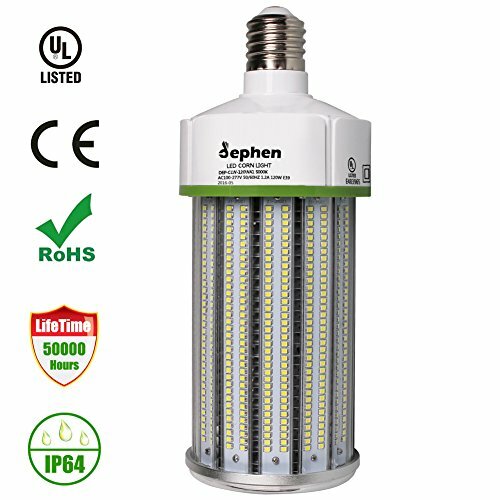 Dephen LED Corn Light Bulb E39 Mogul Base, able to replace metal halide bulb, HID, HPS, CFL used in garage, warehouse, storage room, street, workshop, barn, High Bay, Porch, Backyard, Garden, post light, hospital, hotel, Industrial Lighting, parking lot, Bollard, factory, gas station, etc. Indoor and outdoor, anywhere need to retrofit Replacements. ● Make sure to remove or bypass the ballast in the fixtures before installing. Don't need ballast, just direct wire them. Replacement & Energy Saving: Able to replace 300W to 500W Metal Halide Bulb/HPS/HID with our 120W LED corn light bulb, which can cut down your electricity bill up to 81%. Super Bright : 5000K Daylight, Up to 16200 Lumens at a stunning 135lm per watt ensures fabulous luminous efficiency with low power consumption. Instant On! Certified: Our corn bulb have been certified by UL(E483965) CE and RoHs certification. So they meet the necessary safety and reliability standards and better quality. If you have any questions about this product by dephen, contact us by completing and submitting the form below. If you are looking for a specif part number, please include it with your message.